Winding like a brown python into the Indian Ocean, the Zambezi flows through six countries: Zambia, Angola, Namibia, Botswana, Zimbabwe, and Mozambique. Originating in Zambia, its path through the Batoka Gorge is possibly the most alluring part of the river, with rapids claiming names like The Devil’s Toilet Bowl, The Gnashing Jaws of Death, Morning Glory, Oblivion, and The Ugly Stepsisters. 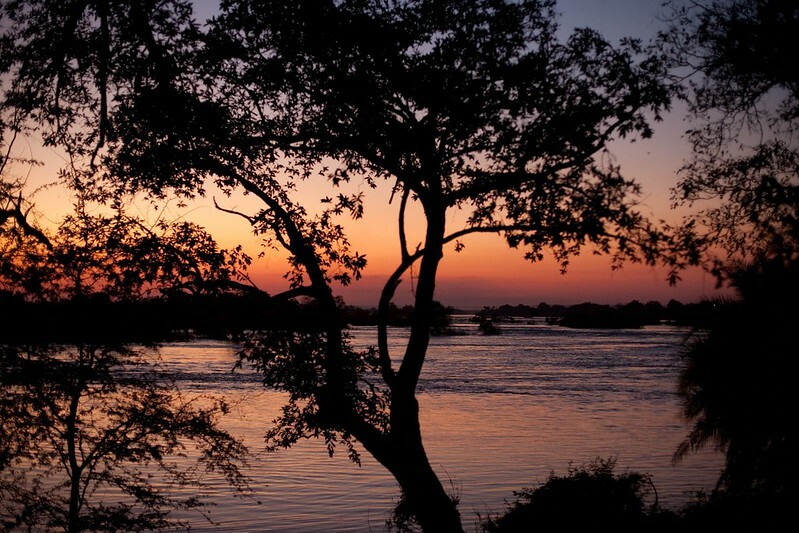 This river is also protected by the Tsonga deity Nyami Nyami, the guardian of the Zambezi River Valley who is described as having the head of a fish and the body of a snake. Elementatia is a less-visited lake compared to other water attractions in Kenya, for example Lake Nakuru and Lake Victoria. So, if you enjoy a sense of privacy and solitude, this volcanic landscape is just the place to go. Its surrounding shores are dry and dusty, inspiring its name Elementeita, derived from the Masai word muteita, meaning “dust place”. At only one-metre deep, the best time to visit is during Kenya’s dry seasons between from July to October and January to February, when tensions rise and thirsty, agitated animals gather around its dwindling watering holes. On the subject of lakes, turn your attention further north to Uganda. Lake Mburo is arguably one of the favourite hidden gems on the continent, especially as it can be seen en-route to the travel company’s gorilla trekking safaris in Bwindi Impenetrable Forest. There are few feline predators in Lake Mburo (besides leopards), but plenty of dynamic characters such as crocodile, buffalo and hippo, colourful kingfishers, magnificent Fish eagles, hammerkops and the prehistoric-looking shoebill. With the great rains of Southern Africa, it all comes down to timing. If you speak to some African travel experts, they will tell you to travel to Africa in the dry season, but that’s not the whole story. The Green Season in December is far more spectacular than the dry season in many important ways. Not only does it mark the birthing season for a new generation of animals, but it also heralds the arrival of many migratory birds like bee-eaters, swallows, cuckoos, kingfishers, and kites. In the Savuti area of Chobe National Park, the Green Season marks the beginning of a great annual zebra migration as they march across the country to meet the new rains for summer grazing. 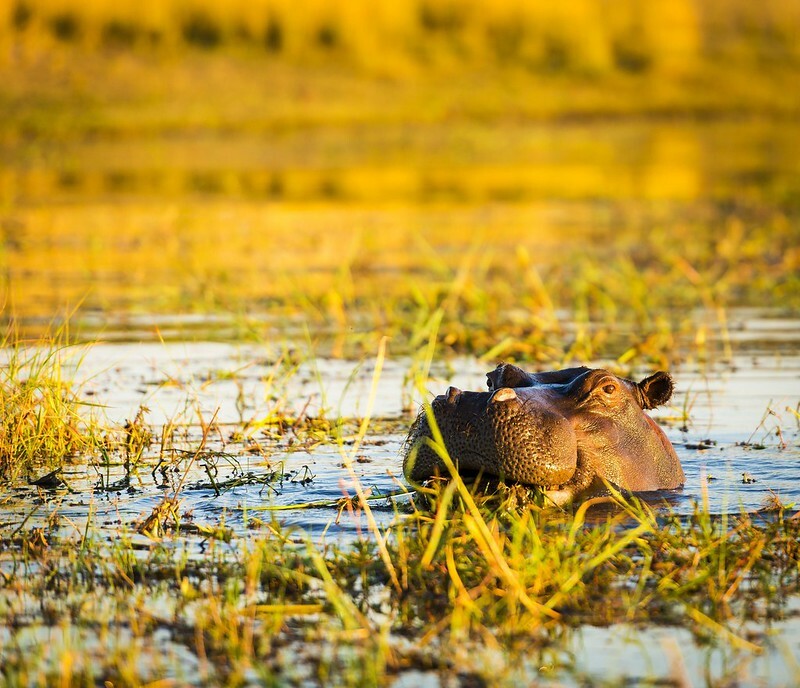 Thinking about wildlife in Botswana, the Okavango is one such watery wonder that you cannot miss. Its Chobe River Front certainly deserves to be added to the list. You can spend a few days marvelling at the wildlife along this winding water source with its super-size herds of elephants, before hopping over the border to see the famous Victoria Falls. Northern Botswana is the country’s wet region, and is crisscrossed by swamps and rivers and wetlands. Both the Chobe and the Zambezi rivers intersect in the north-east corner at the Kazungula border—an incredible meeting point between Botswana, Namibia, Zambia and Zimbabwe. 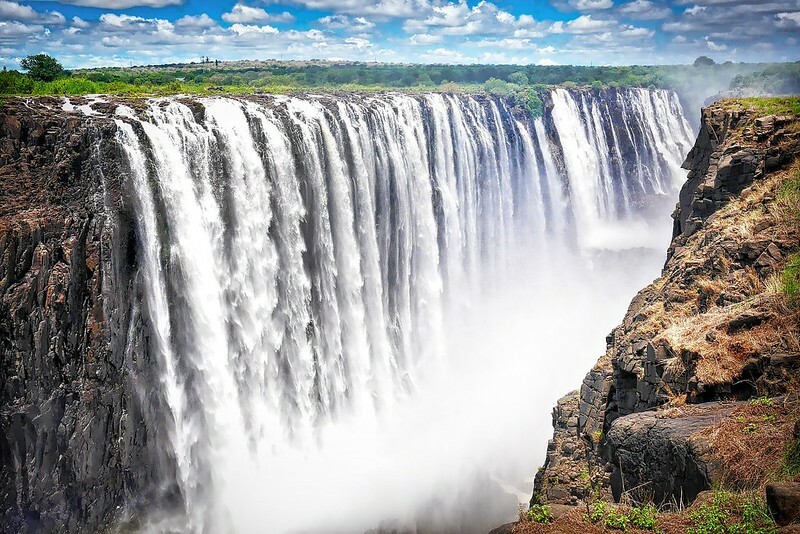 No list of water features in Africa is complete without the most majestic of them all: Mosi-Oa-Tunya (the smoke that thunders), also known as Victoria Falls. Stretching over 1.5km wide into both Zimbabwe and Zambia, it plunges over 100 metres into the Zambezi River gorge below. It’s not the widest waterfall or the highest waterfall but with all dimensions taken into account, including almost the largest flow rate, it is considered to be the biggest curtain of falling water in the world. 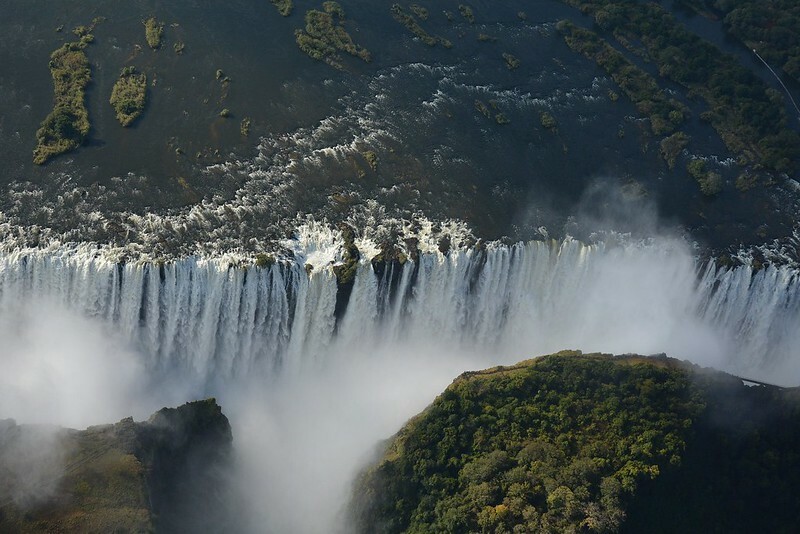 As a highlight on most safari itineraries, the Victoria Falls area is a hub for those looking to enjoy the thrills of white water rafting, canoeing, bungee jumping, sitting in the infamous Devil’s Pool, or just simply relaxing on a sundowner cruise. GETTING THERE: Check out major airlines such as South African Airways, Emirates, Turkish Airlines, Ethiopian Airways, British Airways, Kenya Airways, and RwandAir for flights to Zimbabwe, Zambia, Botswana, Kenya, and Uganda. MALARIA & YELLOW FEVER: Remember that mosquitos love areas where there is water. Make sure you find out which regions have malaria or yellow fever and get advice from your doctor on which vaccinations and medication to get.